“It’s like the Japan from the old times,” our guide, Manabu-san, tells us. As we’re on the train speeding out of downtown Tokyo through the suburbs, past a few industrial estates and tea farms, he checks the translator app on his phone. Finally he finds what he’s looking for: “Also, best in… do you know unagi?” Freshly grilled Japanese eel? Now he’s talking our language! Throw in a pre-arranged appointment to walk around in rented kimono and we’re completely sold on the idea of spending the afternoon in Kawagoe, a city widely known for its historic downtown area. 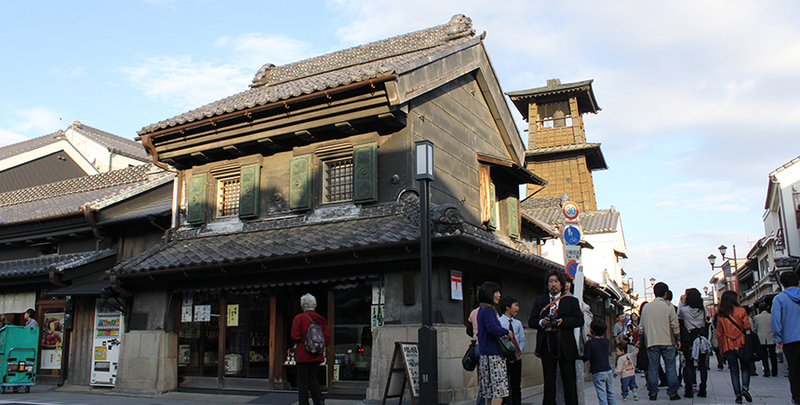 The city center is made up of preserved storehouse buildings, candy shops, stores selling antique pottery and beautiful handmade paper, and 200-year-old restaurants specializing in grilled eel. It’s a short walk from the train station to the heart of the city along streets that contrast sharply in look and feel; modern block buildings give way to structures built in more traditional styles. Some of these architectural gems hark back to the reign of the Tokugawa shogunate. During the era when these military commanders ruled from the capital of Edo (now Tokyo), Kawagoe served as the city’s protective outpost and earned itself the moniker Little Edo. “That one is from the Meiji period,” our guide says, gesturing towards a two-story building with a stone-tile roof and walls of blackened plaster, traces of a great fire that engulfed the city in 1893. We sit down for lunch at Hayashiya, which was once a rice merchant’s storehouse. The floor of the main dining room still sports the metal tracks used for rolling in carts laden with produce and dry goods. After a few minutes, our server carries over several lacquered boxes filled with steaming white rice and fillets of grilled unagi. The sweet and succulent eel, for which locals pay top yen, is not everyday fare in Japan and rightly so: it may not look fancy but many Kawagoe establishments prepare the dish in accordance with centuries-old, secret family recipes. We take one bite, then another and another, oohing and aahing at the flavor, then our eyes begin to glaze over. After lunch, we sign up for kimono and soon find ourselves at the center of a dizzying process of choosing inner and outer garments, mixing and matching prints for the kimono and the obi (belt), choosing the right handbag and hair accessories and actually piling everything on. Once our hair has been put up (it’s important that the back of the collar shows) and we’ve slipped into socks and clogs, we’re ushered outside and in the direction of the nearby Toki no Kane or “Time Bell”. The original bell tower was built in the Edo period and today, the fourth incarnation of the bell continues to toll four times daily, just as it did centuries ago. As we pose in our colorful kimono amid a throng of tourists, the Koedo Loop bus comes into view, seemingly straight out of the 1920s. The bell may still be ringing but for an instant we’re lost in time. It turns out to be a brilliant way to spend an afternoon. Take a Seibu Railway train from Shinjuku Station to Hon-Kawagoe. For train schedules, ticket prices and tour packages, visit www.seibu-group.co.jp. This article originally appeared in the December 2014 issue of Smile magazine.